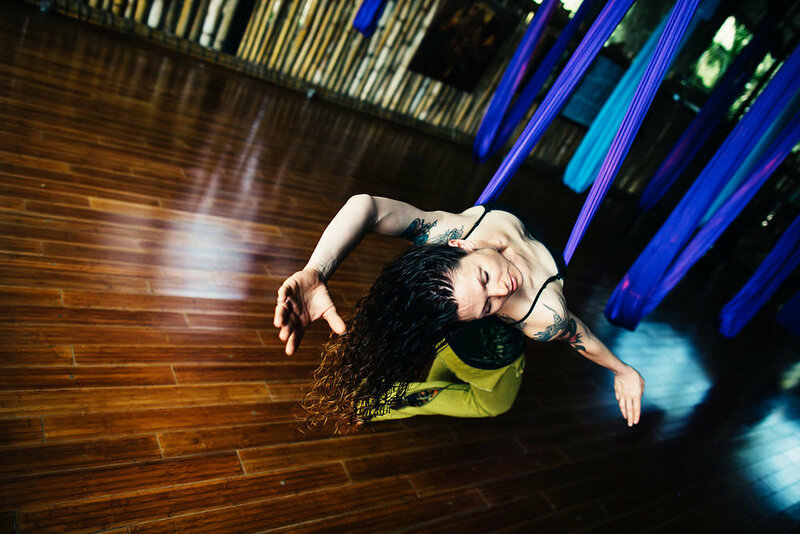 Hello and welcome to my latest love, Aerial Yoga ! If you’d like to attend class in person, check out my weekly classes at Be Well personal training in the Barnyard. Here you will find a growing resource of online tutorials about how to use a yoga trapeze to make more space in your ( most likely) over compressed body. Use this simple tool to reverse the effects of sitting, and start to build core strengthening workouts that teach you how to engage in length, all in the comfort of your own home. This cost effective tool can be hung over any exposed beam, or even off of a pull up bar mounted in a doorway. They cost less than $100 and you can order yours here. It is the best home gym investment you'll ever make. And when you're not using it, it makes an excellent swing/chair for kids and adults alike. You can find more of my training videos on YouTube as well. Any exercise you choose to do is at your own risk. I do not live in your body and assume no responsibility for the movements you make. Please practice consciously and consult your doctor before embarking on any exercise program. It is difficult to find a human over 30 who doesn't suffer from lower back issues. The cumulative effects of years of sitting, bad posture, and questionable exercise choices tend to lodge themselves at the base of our spine, right above the pelvis or somewhere inside this bony intersection. A regenerative approach is multi-pronged, targeting not only the area that experiences pain but all of the surrounding areas that contribute to the problem. Stress and emotional distress are also factors in back pain, and the euphoria/emotional balancing effects of cocooning, rocking, and inversions in the hammock can also be important factors in moving away from a painful existence in your body. I have designed this sequence to be performed in order, beginning on the floor with the Lower Back program and ending with Inversion Program 1. However, once you have learned the sequences, you are welcome to pick and choose as you please, taking 10 minutes here or there to relieve stress in your body as you feel appropriate. Have you ever started to work out, and felt like your body was so out of sorts that things weren't working? Sometimes, before we begin to move, we need to give our bodies the chance to realign. Given the bad postural habits that we all seem to accumulate given the standard first world lifestyle ( driving, sitting too much, leaning on one side for years), it's easy for the pelvis and ribs to move out of alignment. That can mess with all kinds of things, including digestion, your spine, your hip and leg mobility, breathing, the neck and shoulders... you name it. This series uses a yoga block and the trapeze to shift the balance between the ribs and the hips in a few different ways, along with giving some feedback to the spine from both ends. It is an excellent "end of the day" series. As always, you can do it whole ( from the start to finish) or in parts. Please note that you may want to use different props, depending on your body and what you have on hand. I enjoy a 4 inch yoga block ( with my flexible spine) but a folded seat cushion or a couple of folded towels stacked together can easily be substituted. If your head needs support, please do use a pillow to minimize neck strain. You can also use a pillow in between the lower legs when they're suspended in the hammock if you feel like your legs are being drawn too close together. For the "fish pose" ( where the ribs are over the block and the hips are down), I would recommend that you begin with using one rolled up towel, and add more padding as your ribs adjust to the "lift".